It seems that singer Otile Brown has finally found a woman he can settle down with. He revealed this through his Instagram page where he shared their video together and from the caption, indeed things are serious. Otile Brown describes his new woman as the only lady who has managed to tame him. He goes on to add that he will no longer be chasing other women now that he scored the real deal. He wrote saying; Yani wewe na uhuni na ujanja wako wote lazima utakutana na kiboko yako atakaye kutuliza..Wifi yenu @nabbi_ wewe kiboko… tell e’m hoes am done done ‍♂️, Nimewala sana 臘‍♂️, sai nimetulia staki mbwembwe  #BadMan #wegotnothingbutlove Ethiopian girlfriend Thanks to Otile Brown sharing the lady’s Instagram handle, we managed to get a few photos and details about Nabbi, his new girl. She is one fine lady living Australia where the singer recently visited during his music tour. 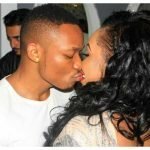 Well, below is the latest lady Otile Brown is introducing on social media after his bitter break up with Vera Sidika. The post Otile Brown bags himself a hot Ethiopian girlfriend (Photos) appeared first on Ghafla! Kenya.